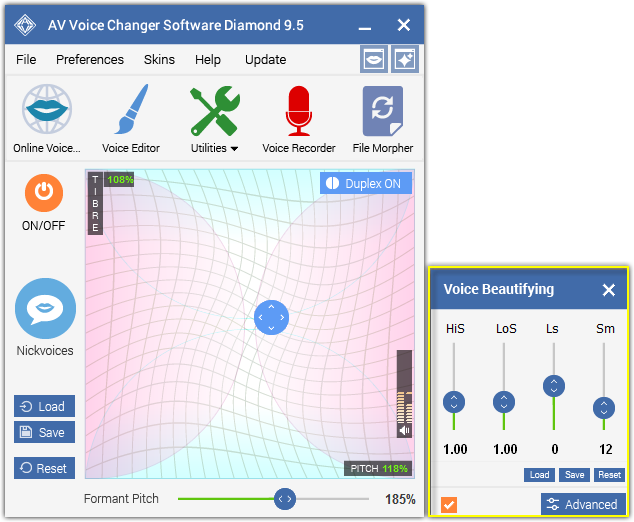 Voice Morpher refers to the 3 main groups of voice editing and morphing settings situated on the main interface of Voice Changer Software Diamond 9.5, and it includes Voice Attributes, Voice Beautifying, and Voice Effects. The combination of one or more group settings produces a unique output voice with specific characteristics. Nickvoice – inspired by the Netglish “nickname”word– is a voice that characterizes the voice of the person you choose to mimic in cyberspace. Technically, it is a file combining the results of modified settings made within Voice Morpher. ► Ready-to-use nickvoices: Explore the Nickvoice menu for over 60 ultimate, ready-to-use voice presets, or “nickvoices”. Now with just one click you are able to apply these files instantly and change your voice to various voice types and genders. 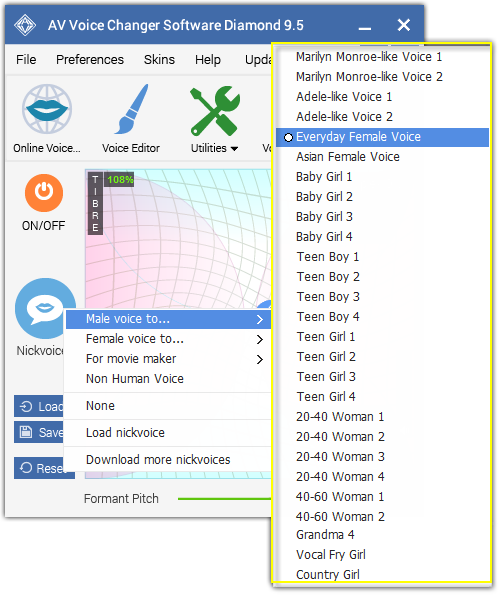 ► Customized nickvoices: If you are not satisfied with a Nickvoice preset, you can try modifying the output (as detailed in section 2, 3 and 4 below), separately or together, to achieve your own desired, unique voice qualities. Click Save to save your newly created nickvoice (under *.nvc file) for later use. Click Load to load a pre-saved nickvoice (*.nvc) file. Click Reset to revert Voice Morpher to its default settings. The combinations of adjusting of the Pitch/Timbre/Formant Pitch are unlimited and may produce any voice-output we like. 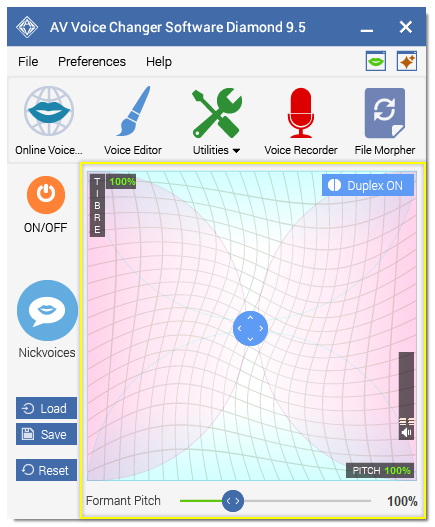 PITCH (Default 100%): Digitally changes the voice-input’s “rate of vibration” to faster or slower (without affecting the voice stream speed) hence raising or lowering the pitch of the voice without affecting the other properties. TIMBRE (Default 100%): This refers to the tone “color,” or tone quality, that defines a particular voice and makes it different from another voice, even when they have same Pitch (and loudness). 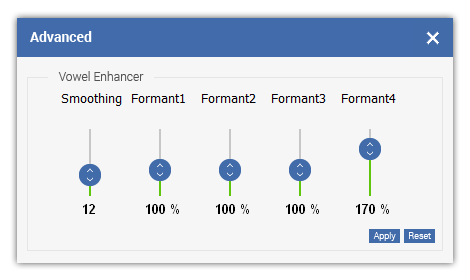 FORMANT PITCH (Default 100%): Think of this tool as a “correcting” tool to return a more natural output quality to the original voice, and it allows users to modify a voice’s pitch without affecting its other qualities. Each value represents a vocal quality within a frequency range. Making adjustments to these frequency ranges is like controlling the “tissues of the vocal cords,” thus reproducing such rich voice qualities as soft talking, falsetto singing, and qualities such as rough, aphonic, breathy, creaky, hoarse, etc. Note: Shifting the LoS and Ls too high or too low may change the voice-input accordingly higher (female, boy) or lower (male). These settings also effect pronunciation and in some cases can be altered to form an accent for the output voice. The lower the values are, the lower the formants will be moved, and the lower the modified voice will be. Vice versa, to make the voice squeakier, increase the formants’ values. Smoothing (Default 7): Sets the smooth width within which noise will be processed to produce a softer signal. The higher value, the wider range smoothing algorithms will work on, but the greater possibility of signal distortion. ► Fine Tune (Default 65%): A special control for adjusting a voice’s timbre. This control is useful when you want to morph only the vocal of a song, either from an Audio CD or MP3 file, while keeping the background music intact. The lower the value, the closer to the original the morphed voice will be. Limiter: Prevents both voice distortion and clipping that may occur during the application of a complex set of adjustments to a voice sample whose attributes are not constant. This helps to stabilize the output. Release (Default 200ms): Adjusts the holding time of the attenuated volume. Under low values you may observe some sound “croaking;” using a higher value may cause the signal to weaken/fade. 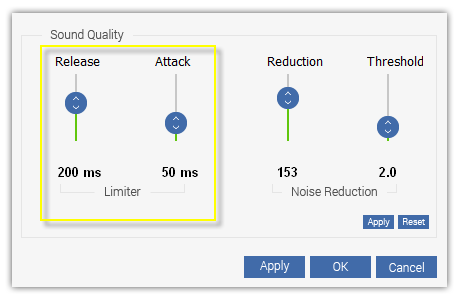 Attack (Default 50ms): Defines the effect reaction speed to volume increase if it exceeds the allowable threshold. Low values may cause unnatural sounds to be generated. Higher values could clip the signal during adjustments. 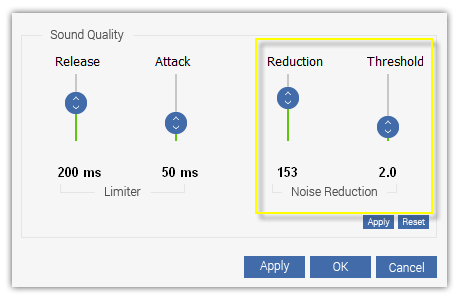 Noise Reduction: Eliminates background noise but leaves the most useful signals intact. Reduction (Default 200): Defines the amount of noise to be removed. Higher value removes more noise but may distort the useful part of the signal. Threshold (Default 2.0): Defines the threshold below which the sound is treated as noise. 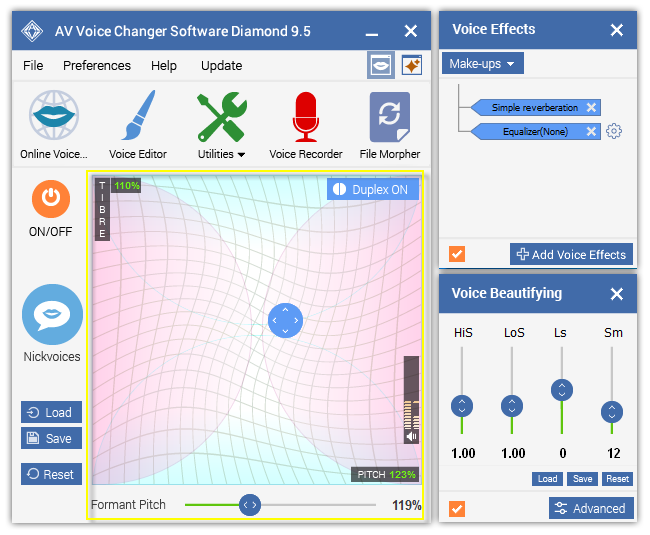 ► Voice Effects: Voice Effects are used to polish output result and applied directly to the input sound signal which can be your voice or pre-recorded audio files. ► Background Effects: Background Effect is a kind of sound which serves as a background for your voice in the appropriate situation or place you would like to be. ► Non-human Voice Effects: Non-human Voice effects totally replace human voices with the animal sounds according to the input level of the input human voice. Each non-human voice a group of several sounds of one species of animal, and each sound is related to a unique human voice level. The output sound will be a series of discrete sounds that react to changes in the human input. ► Other (Equalizer): Equalizer offers the major means of controlling sound quality. It allows users to alter the sound through ten sliders that represent ten frequency bands: 30 Hz, 75 Hz, 140 Hz, 280 Hz, 560 Hz, 1000 Hz, 2000 Hz, 4000 Hz, 9000 Hz and 16000 Hz. Some particular effects are only applicable in real time. Only one Voice Effect in a group can be selected at a time. Only one Background Effect and Non-human Voice Effect can be selected at a time. To expand a group: Click the + icon before a group or double click the group name. To collapse a group: Click the - icon before a group or double click the group name. 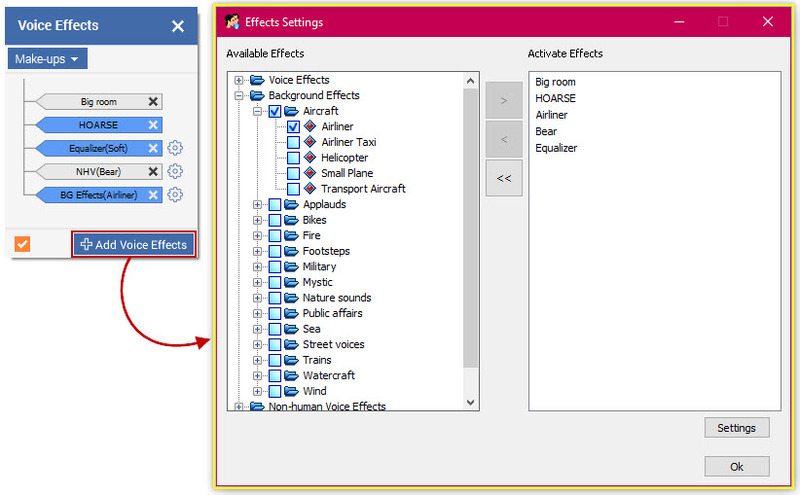 To select an effect: Check the checkbox before the effect or double click on the effect name. If an effect in a group is being used, the checkbox before the group name is also checked. The effect will appear in the Activate Effects pane on the right, and will be applied right away. To deselect an effect: Clear the checkbox before the effect name or double click on the effect name. The effect will be remove from the Activate Effects pane. Use > or < to move effects between 2 panes: Available Effects and Activate Effects. Use << to clear the Activate Effects pane, which means no effect is being used. ► Voice Types: Preset combinations of one or more Effect plug-ins. 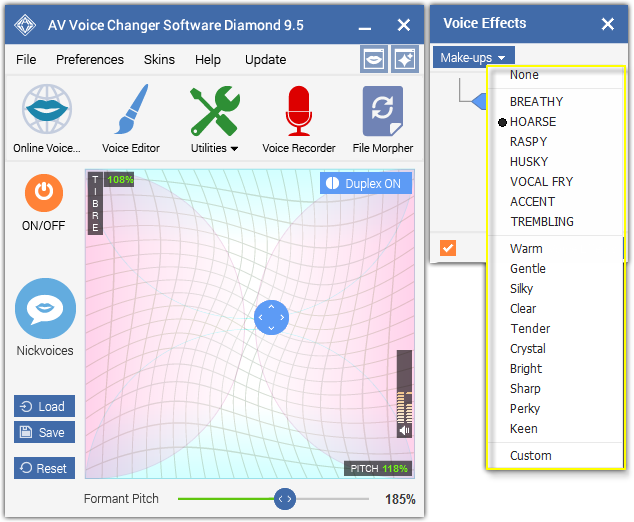 The component effects of a voice type are available in Effects Settings. ► Voice Qualities: Presets for the Equalizer made up by filtering varied bands, and are also customizable. More equalizer presets can be found in Effects Settings. You can Save your customized presets (under *.eq file) for later use and Load them when needed.